Day 1: Board near the island of Sveti Stephan connected to the mainland by a sandy beach isthmus. Today the island, once a fortified village, and a large villa on the mainland, are now an Aman Hotel, Aman Sveti Stephan. Anchor in the protected bay north of the isthmus and enjoy the water, beaches and the hotel area. The hotel part of Sveti Stephan is a fortified village from the 15th century and is filled with cobblestone streets. 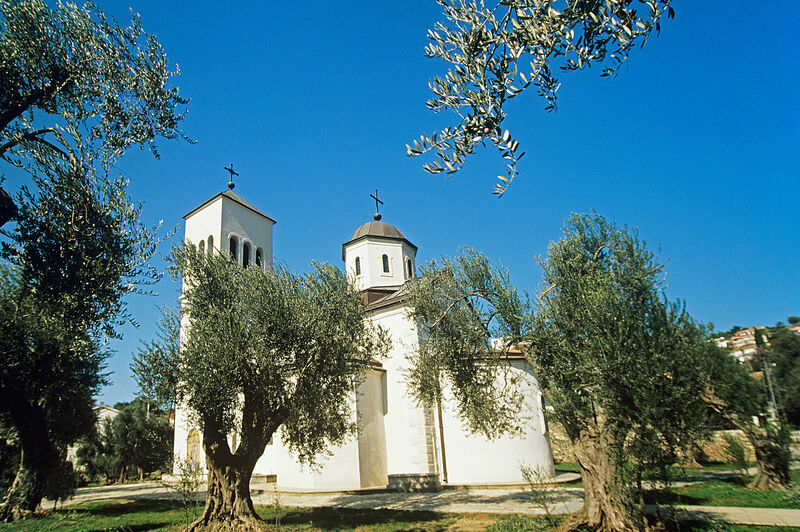 Villa Milocerouce on the mainland was the summer residence of Queen Marija Kardorcleric and is surrounded by olive trees and ancient cedar and pine forests. Relax with water, fun and time on the beaches, and perhaps have a cocktail or dinner at the resort. Day 2: Cruise to Petrovac with a 600 meter sunny beach. 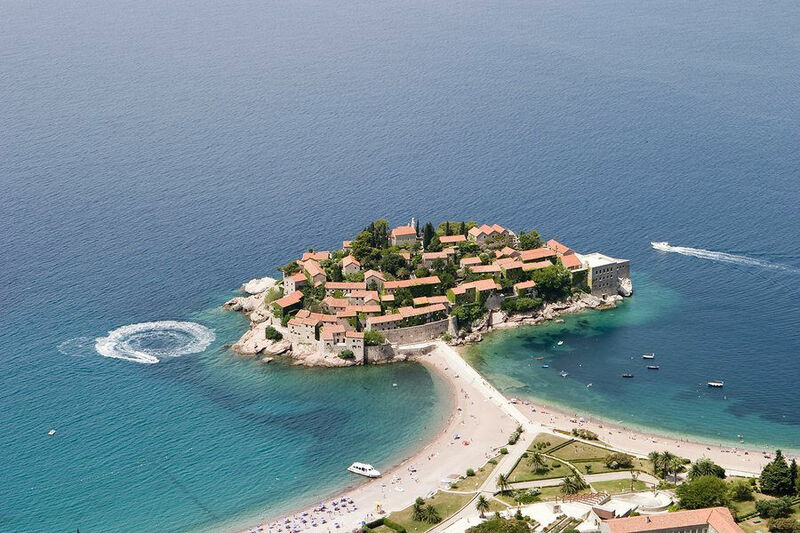 Montenegro is a country of sun and beaches, and Petrovac is no exception. 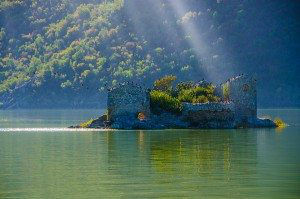 With the bay dominated on one side by 16th-century Venetian fortress, Kastel Lastva, built to discourage pirates, Today there is a night club inside the castle. Petrovac also has Roman remains, including several mosaic floors. Off of Petrovac are two small islands sitting very attractively in the bay: St. Sunday Island with the ruins of a small chapel perched at the top of the island and Katich, uninhabited except for a few pine trees. Anchor in the bay to enjoy the water and beaches, and wander ashore to explore town and the castle, and perhaps wander to town later at night for a little dancing in a Venetian fortress on the water. Overnight. Day 3-4: Cruise to Ulcinj the southernmost city on the Montenegrin Coast, and like other towns on the coast of Montenegro, Ulcinj, a picturesque town, is famous for its beaches, claimed by the locals to be the most beautiful in Montenegro. Also known as the Ulcinj Riviera, the Velika Plaza (“Big Beach”) is 12 kilometers long as is considered the longest sandy beach on the Adriatic coast along the beach is “The Korzo”, or a boardwalk, along the beach, and at night during the summer months The Korzo is a lively location to promenade and people watch. Big Beach ends at the estuary of the river Bojana, where a sandy, triangular island is located, one of the most attractive areas in Montenegro. One of the oldest towns in the Adriatic, Ulcinj can be entered by two gates, one from land and the other from sea. In the dark dungeon of Ulcinj, behind the famous Balsic Tower, the famous Spanish writer Cervantes was jailed, as well as Sabbatai Zevi, an advocate of Talmudic reform. Located in Ulcinj, is the Castle of Ulcinj, which is a very well preserved medieval castle and town which sits on top of a mountain overlooking the shore. Ulcinj’s salt ponds are a popular location for bird watchers, with the salt ponds and area a resting spot to over 200 bird species on their migration paths. You can spend several days in this area enjoying the various beaches, beach life, The Korzo, and exploring the town of Ulcinj. Day 5: Cruise north to Bar. 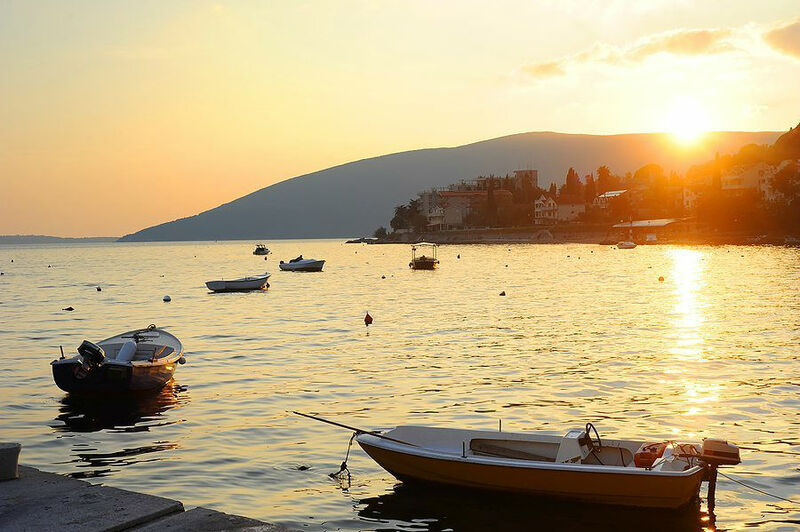 One of the sunniest towns in the Mediterranean, Bar is a major seaport for Montenegro. Bar was settled in Neolithic times, however the busiest time period in the history of Bar was during medieval times, with Bar an especially important location in ecclesiastical history as the home of three religions, Orthodox, Catholicism, and Islam. Also known as Antibari in earlier centuries, due to its location opposite or “Anti” Bari Italy, Bar was one half of the equation for the first radio connection made by Guglielmo Marconi in 1904; which was between Bari, Italy and Bar, Montenegro. With a nice large seaport ringed with beaches that extend on either side of the port for over 9 kilometers, Bar is a great beach location. Bar is also home to King Nikola’s Palace built in 1885 as a present to his daughter Princess Zorka and his son-in-law Prince Petar Karađorđević. The complex consisted of a large palace with a ballroom, a little palace, a chapel, guardhouses and a winter garden. King Nikola was a yachtsman as well, and in front of the palace was a wooden pier. Over his lifetime, King Nikola owned 10 yachts, one of which, “Sibil”, was purchased from Jules Verne. Today, in the garden, a large stainless steel structure, originally given as a present by the Italian King Emanuel, is now a restaurant called “Knjaževa bašta” (“The Duke’s Garden”). Open to the public, the palace complex houses the Homeland Museum of the City of Bar and is also used for public festivals and concerts. Day 6: Cruise to Bigova, a delightful and unspoiled fishing village where during the season you can buy fresh fish from the local fishermen right on the quay. 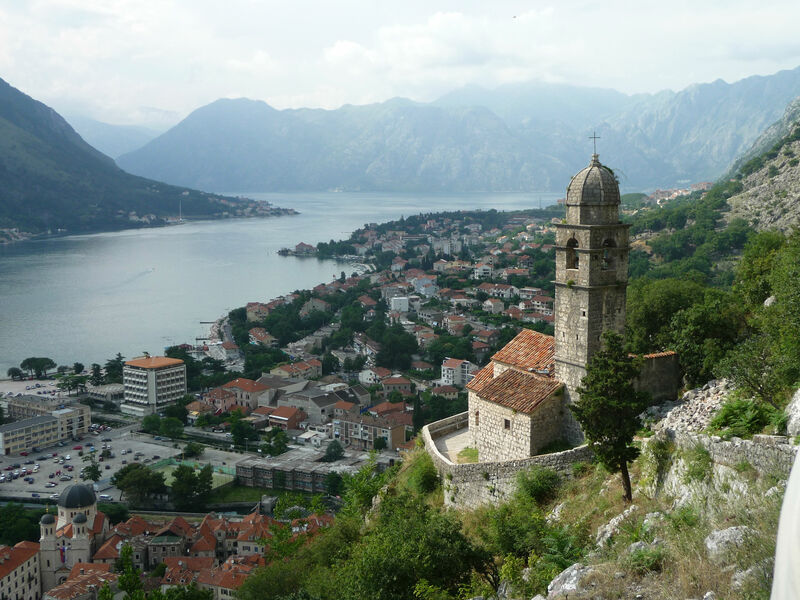 This is a great location to relax and enjoy the sun and natural beauty of Montenegro, along with the beaches and great swimming. This is a good anchorage for an overnight.